Grand Silver New Year's Eve Party Kit for 50 People. 25 Shiny Black Top Hats with Silver Accents. 25 Feather Plume Accented Glittered Tiaras. 25 Fringed Horns. 25 Black and Silver Noisemakers. 200 Serpentine Throws. Blank. 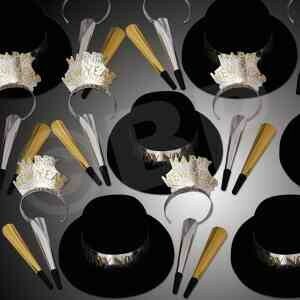 Ebony and Gold New Year's Eve party kit for 50. 25 plastic Happy New Year top hats, 25 gold glitter on black Happy New Year tiaras, 50 black horns, 200 serpentine throws. Blank. Merry Makers New Year's Eve Party Kit for 50 People. 25 Black Plastic Top Hats with Brightly Colored Accents. 25 Colorful Tiaras. 25 Assorted Color Horns. 25 Metallic Noisemakers. 200 Serpentine Throws. Blank. Black and white party kit for 50. 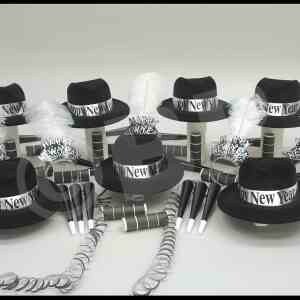 Each kit comes with 25 assorted black and white velour fedora gangster style hats, 25 silver glitter tiaras trimmed with black and white plume feathers, 50 black 9" horns, 25 assorted black and white 33" bead necklaces . Western Nights New Year's Eve Party Kit for 50 People. 25 Black and White Assorted Velour Fedoras with Gold Band Accents. 25 Glittered Tiaras with Plume Feather Accents. 40 - 9" Gold Foil Horns. 10- 6" Cowbells. 12 Cowboy Boot Beads Necklaces. 13- Gold Metallic Bead Necklaces. Blank. Party in the City New Year's Eve Party Kit for 50 People. 25 Black Velour Gangster Fedora Hats with Silver and Gold Accents. 25 Silver Happy New Year Tiaras with Gold Accents. 50 Black and Silver Assorted 9" Foil Horns. Blank. 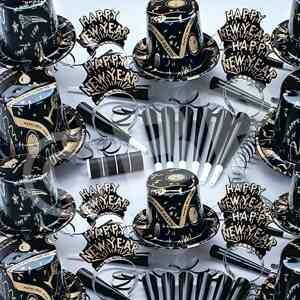 Midnight Metallic New Year's Eve Party Kit for 50 People. 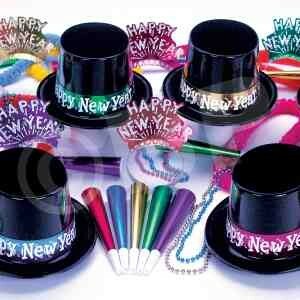 25 Black Plastic Top Hats with Happy New Year Bands. 25 Happy New Year's Glitter Tiaras. 50 Assorted Color Foil Horns. 25 Plastic Bead Necklaces. 25 Plastic Lei Necklaces. Blank. All That Jazz New Year's Party Kit for 50 People. 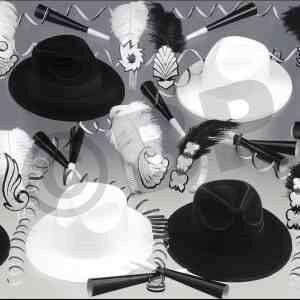 25 Black and White Assorted Velour Top Hats with Happy New Year Bands. 25 Black and White Assorted Feather Plumed Tiaras with Glitter Accents. 25 Silver Metallic Beads. Blank. Golden Fantasy New Year's Eve Party Kit for 50 People. 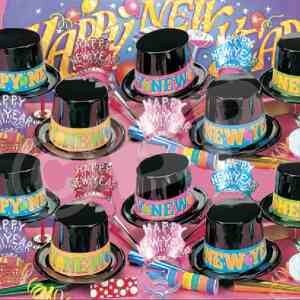 25 Black Plastic Top Hats with Gold Prismatic Bands and Happy New Year Accents. 25 Black and Gold Happy New Year Glittered Tiaras. 25 Horns. 25 Metal Noisemakers. 200 Serpentine Throws. Blank. Showboat New Year's Eve Party Kit for 100 People. 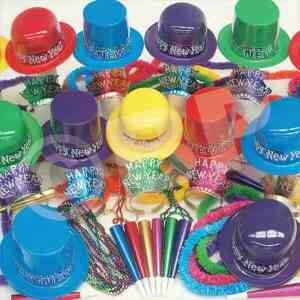 50 Assorted Color Plastic Top Hats and Derby Hats. 50 New Year Glitter Tiaras. 100 Colorful Foil 9" Horns. 25 Assorted Color Metallic Bead Necklaces. 25 Assorted Color Plastic Lei Necklaces. Blank. 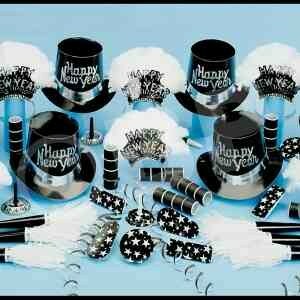 Happy New Year Metallic Cabaret Party Kit for 50 People. 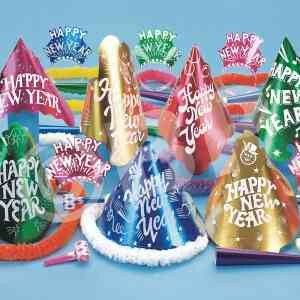 25 Happy New Year Foil Cone Hats. 25 Happy New Year Foil Tiaras. 25 - 9" Foil Horns. 25 New Year Blow Outs. 25 Lei Necklaces. Blank. Glimmer and Shimmer New Year's Eve Party Kit for 100 People. 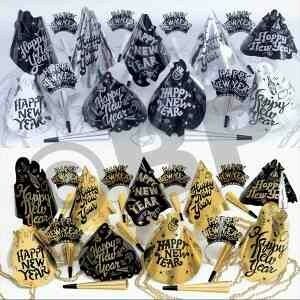 50 Foil Happy New Year Cone Hats. 50 Glitter Happy New Year Tiaras. 50 Gold and Silver Assorted Bead Necklaces. 100 Gold and Silver Assorted Foil Horns. Blank. Silver Midnight New Year's Eve Party Kit for 50 People. 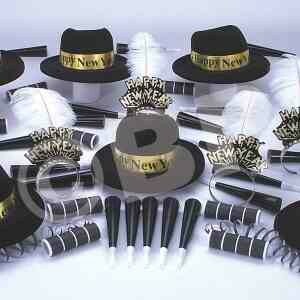 25 Black Fedoras with Silver Happy New Year Band Accents. 25 Happy New Year Tiaras with Plume Feather Accents. 50 Black Metallic Horns. 200 Serpentine Throws. Blank. 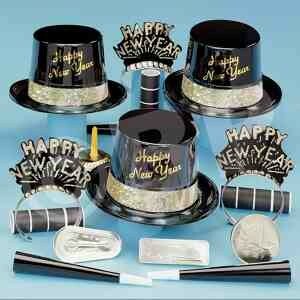 Silver and Ebony fantasy New Year's Eve Party Kit for 50 People. 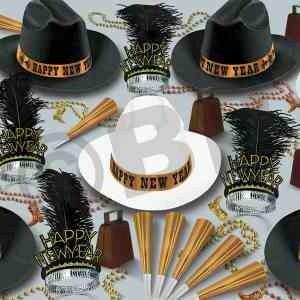 25 Black Plastic Top Hats with Silver Prismatic Bands and Happy New year Accents. 25 Black and Silver Happy New Year Glittered Tiaras. 25 Assorted Metal Noisemakers. 25 Foil Horns. 200 Serpentine Throws. Blank. 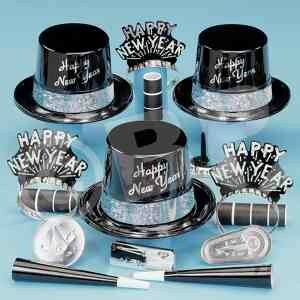 Gatsby Black and Silver New Year's Eve party kit for 50. 25 black foil hats/black plastic top hats with silver glitter accents, 25 black and silver sparking tiaras, 25 foil horns, 25 metal noisemakers, 200 serpentine throws. Blank. Golden Midnight New Year's Eve Party Kit for 50 People. 25 Midnight Black Velour Fedora Gangster Hats with Gold Band Accents. 25 Happy New Year Gold Glittered Tiaras with White Plume Feathers. 50 - 8" Black Foil Horns. 200 Serpentine Throws. Blank. 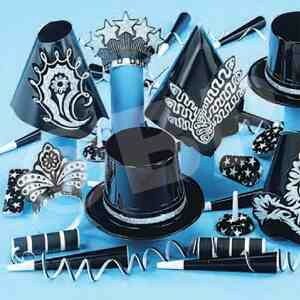 Ebony and Silver New Year's Eve Party Kit for 50 People. 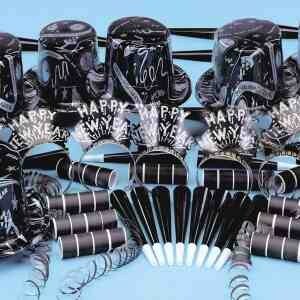 25 Plastic Happy New Year Top Hats. 25 Glitter on Black Happy New Year Tiaras. 50 Black Horns. 200 Serpentine Throws. Blank. Grand Slam New Year's Eve Party Kit for 100 People. 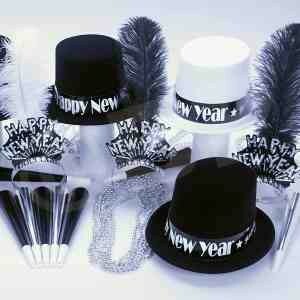 50 Happy New Year Hats in Assorted Colors and Styles. 50 Happy New Year Tiaras in Assorted Colors. 50 Assorted Color Lei Necklaces. 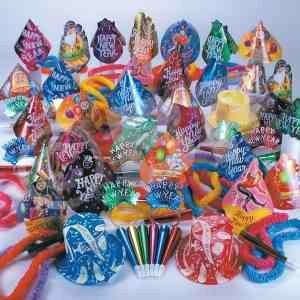 100 - 9" Assorted Color Foil Horns. Blank.